The power of the effect is symbolized by the . Once the effect of the Enemy card has been applied, the card should be placed on the discard pile. 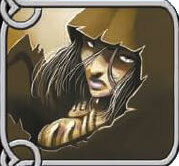 Hel, the Goddess of the Dead, empties the bags of their Vikings to take them to the World of the Dead. Its result refers to an Island bag. From the selected Island bag, take a number of Vikings equal to the power of the effect in Hel's arrival area. Place the counters you have taken out on the World of the Dead. If there are not enough Vikings left in the bag, take all the remaining Vikings. The Die is pointing out the green bag. 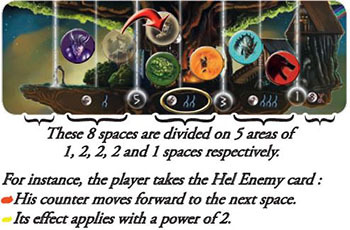 Hel is located in the fourth space, just beyond the wall of Asgard. In this area, the power of the Enemies' effects is 2. So, the active God removes 2 Vikings from the green bag. Surt takes the Fire Giants to attack Midgard He pollutes the bags with the Fire Giants counters. 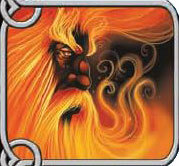 Out of the Kingdom of Fire, take the number of Fire Giants equal to the power of the effect in the Surt's arrival area. Put these counters in the Island bag indicated by the die. If there are not enough Fire Giants left on the Kingdom of Fire, take all the remaining Fire Giants. The Die is pointing out the blue bag. Surt is located in the fifth space, in front of the door of Valhalla : his effects power is 2. The active God puts 2 Fire Giants in the blue bag. Place the Submerged Island counter on the Midgard Island indicated by the die. Put the Valkyries back on the Rainbow Island. Jormungand's effect is not dependent on its power. Loki, the traitor, calls the Giants to spreadpanic in Yggdrasil. Take the number of Giant cards equal to the power of the effect in Loki's arrival area. Place these cards, face up, next to the Ice Fortress. These Giants become active, which means that their effect applies immediately and lasts as long as they are in play. If there are not enough Giant cards in the Ice Fortress, put in play all the available Giants. Loki moves on the third space, in front of the wall of Asgard. His effects power is still 1. One Giant card is taken and placed next to the Ice Fortress. That is Gialp: from now, the Gods are not allowed to perform the action corresponding to the Kingdom of Fire until Gialp is defeated. Nidhogg speeds up the game. He drags an Enemy. Beware ! this effect can be tragic. Move the Enemy that is farthest behind (it can be Nidhogg) forward one space to the right, without applying any effect. If several Enemies are farthest behind, the Gods choose which one they want to move forward. Nidhogg's effect is not dependent on its power. Nidhogg drags Surt, who was the Enemy that was farthest behind. Fenrir makes the Gods waste their actions. He is a formidable Enemy. Do not let him move forward too far ! When a player has taken Fenrir from the stack, he has no choice : he must, with his actions, try to calm him down before performing any other action. Each new attempt is considered as an action. When Fenrir is calmed down, you can perform the remaining actions you have ; but all the while he is angry, it is impossible to perform any other action. 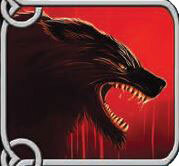 If Fenrir is still angry after you have performed your actions, the next God will have to try to calm him down too (after having taken an Enemy card from the stack and applied its effect). If Fenrir is taken from the stack as he is still angry, his counter moves forward but his effect does not apply. 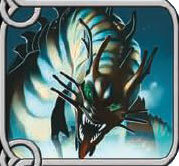 The new Fenrir card should be placed on the discard pile. The active God goes on trying to calm him down. 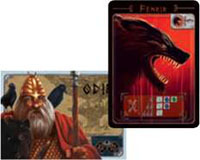 Odin has taken Fenrir who moves forward one space and passes behind the wall of Asgard: his power is 2. In order to calm him down, Odin rolls the die: First action : result: black: he must do it again. Second action : result green : he must do it again. 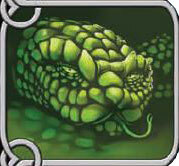 Third action : result: green : he fails once more. His turn ends. 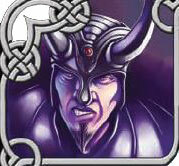 The following player, Thor, takes an Enemy card: Surt. He moves forward Surts counter and applies his effect. His first action must be to try to calm down Fenrir. He rolls the die. Result: white - Fenrir is calmed down. Thor can perform his 2 remaining actions.